the lots size can not be changed, the EA uses the minimum lot size specified for current symbol. 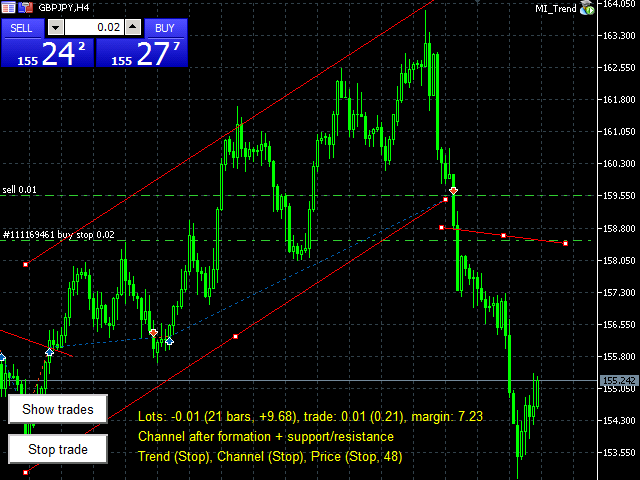 More detailed information about the strategy, input parameters, and blog on real-time trading using the MI_Trend can be found on the website www.alta-studio.com. MI_Trend is a semi-automatic Expert Advisor based on following the trend. Trader manually plots the support/resistance line on the screen, and the EA trails the stop loss along that line to close/reverse the position. During a reversal the stop order is placed automatically at the opposite level of the price channel, until the trader places a new support/reversal line. When trading on 1-4 hour charts, it is sufficient to update the levels 1-2 times a day, and all the remaining time the stop order will trail the level automatically, until the order is executed. 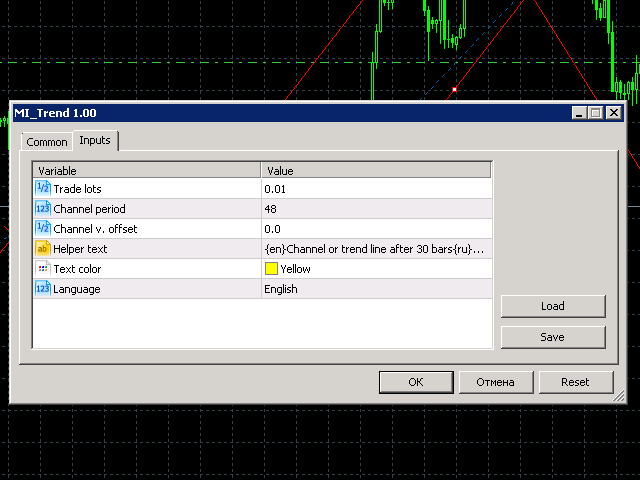 During the order execution the EA sends a push-notification to a mobile MetaTrader 5 terminal and places a protective stop order at the level of the price channel. 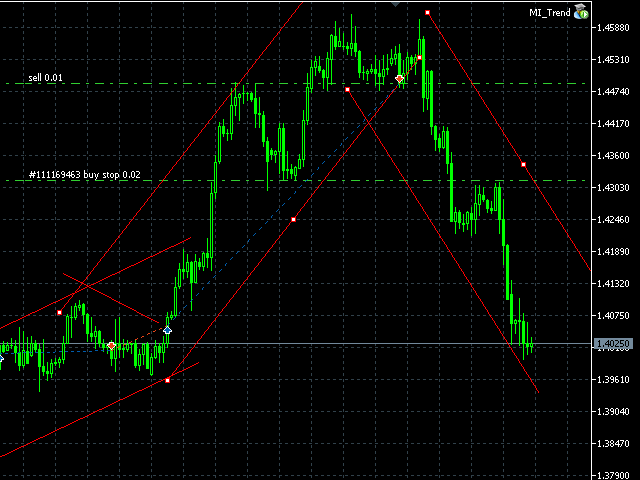 This is enough for the trader to open the terminal and plot a new support/resistance level in the next 12-24 hours. 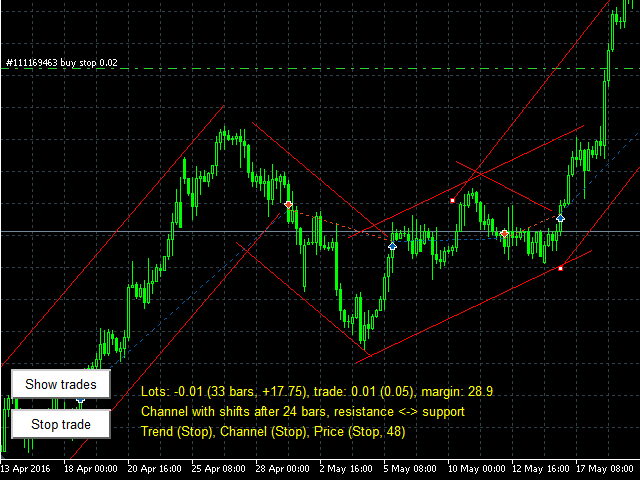 Place the trend line or the equidistant channel on the chart so that the right edge goes beyond the last price bar. Then the EA will accept the object to track. Drag the object or place a new one to change the level. The EA distinguishes different types of objects and uses the last moved lines and channel. If there is a line, it is used first. If there are no lines, an equidistant channel is used. If both are missing, a price channel is used. The price channel is not displayed by the EA. If necessary, it can be displayed by downloading from the market individually, but it is not required for the EA operation. 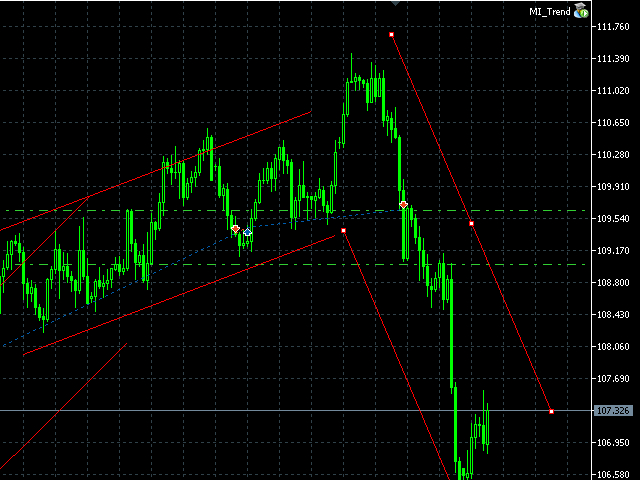 The trend line and channel are used to open and close/reverse positions. If the slope is positive (upward) a sell stop order is placed, if negative (downward) - buy stop order. The lines in the opposite direction to the open position are ignored. The EA works best on the pairs with distinct support/resistance levels, for example, for Forex: EURUSD, GBPCHF, USDJPY, GBPJPY; FORTS: Si, Eu, ED.